In a landmark study published earlier this week in Nature, scientists from the UK and Canada have studied the genetics of breast cancer and established that the disease can be classified into 10 separate subtypes. This novel finding could change the future of breast cancer diagnosis, treatment and survival. The research group, known as the Molecular Taxonomy of Breast Cancer International Consortium or METABRIC, analysed the genetic fingerprints of breast tumour samples taken from 2,000 women diagnosed between five and 10 years ago. They studied both DNA and RNA to establish which genes were switched on or off for each tumour sample. This combined analysis enabled them to reveal the identities of oncogenes – the genes that promote cancer – and tumour suppressor genes, which provide protection against cancer. 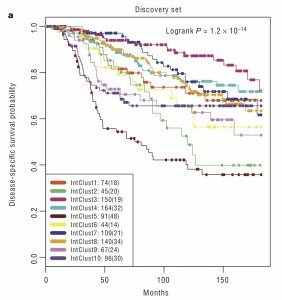 First, during the discovery phase, a statistical technique called cluster analysis was employed on 997 tumours to establish the ten subgroups. Then, in the next phase, the researchers confirmed the validity of these subgroups by testing them on a separate set of 995 breast cancer tumours. The scientists also had access to the women’s clinical history: their age at diagnosis and their long-term survival rates. As seen in the diagram on the right (which can be magnified by clicking on it), the disease-specific survival probability has been plotted against the length of survival in months. Depending on the subgroups, which are colour-coded as IntClust1 to IntClust10, an individual’s survival can be predicted. The leader of the Vancouver team, Samuel Aparicio, described the 10 subgroups as a new “molecular map” of breast cancer that has important implications for the development of novel medicines. Their next step will be to establish the cause-effect link between molecular patterns and tumour growth, and to search for specific targets for new drugs. In the spirit of cooperation, all the information from their study will be available to scientists worldwide. This is good news indeed. Long ago we used to correlate survival with stage and differentiation (“well” and “poorly”). This progressed to receptor expression (five possibilities: ER+, PR+, ER+ + PR+, HER2+, nil). This paper extends the correlation into 10 subgroups. ie “good” profiles and a “bad” ones. What is crucial – and remains – is whether these profiles can be modified. Can very special drugs be evolved that attach to, and modify these receptors? I am mildly excited.